How has your 2017 been so far? Has your life changed with all the new year resolutions you have made? Here are 3 quick tips to help your kids really ace 2017! Almost all of us will say we want healthy, happy and well-rounded children. But then school and other pressures set in, and by the end of January, we all turn into harried, stressed-out people ruminating the education system for its relentless and “high stakes” measurement of grades. Perhaps it is time to clearly see academics and grades for what they are – just ONE of at least three arenas in order to excel in life, the other two being Character and Real World Success. Are you doing what it takes to help your child do well in all these 3 arenas? Knowing your child’s unique interests and natural talents is a great first step. What to find out more? Tip: Flying Cape is currently offering 100 free online Multiple Intelligence Assessment Tool accounts. This assessment was designed in Kent University and has been validated by Harvard University. Get your account today by emailing Flying Cape. PERFORMANCE CHARACTER enhances moral character. LEARNING MULTIPLIERS help you to learn better and faster, and improves academic and all future learning. INTERACTION MULTIPLIERS enable us to connect well with people and ace whatever job we set our hearts and minds to do. Wouldn’t it be nice if your child could somehow memorise key points at double your current pace (LEARNING MULTIPLIER), reduce study time by half, and achieve the same results? Or if you went in for a meeting and established such a good working relationship with the other side (INTERACTION MULTIPLIER) such that they doubled their sales order? And the beauty of Multipliers is that they have a lifetime cumulative effect! Tip: Did you know there are classes that help to improve Performance Character, Learning Multipliers and Interaction Multipliers? Flying Cape’s advanced search system allows you to search for classes with these filters. In real life, experience and prior achievement does count as well. 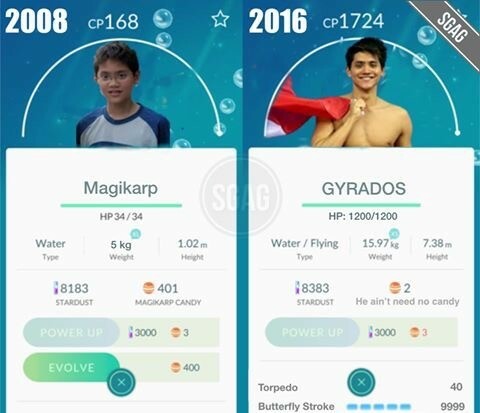 The price that Joseph Schooling paid was the daily grind since he was a little Primary school boy. Besides his natural talent (see point 1 above), his 10,000 hours of hard work got him to where he is today. If you think you or your child can benefit from some professional help in morphing from a Magikarp to a Gyrados, Flying Cape is here to assist. Let our proprietary CompassMap put the pieces together for you so that you can chart a clear way forward for a truly holistic and effective education for your children.